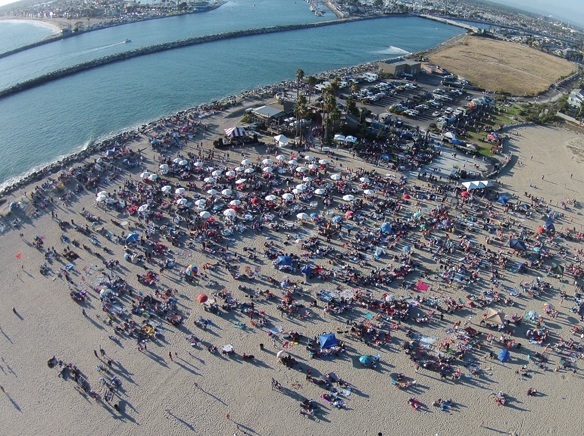 The annual Band on the Sand event has drawn a large crowd each year since the event began in 2014. At that time, Band on the Sand founder Rosie Ritchie told the Sun she hoped the event would become a tradition. The fifth Band event will take place Tuesday, July 3. The event will be held where it is always held: on the sand where the Pacific Ocean meets the San Gabriel River. The community event will start at 4 p.m. There will be live music by the Elm Street and King Salmon bands, a dance area, a kid’s zone, food trucks and bicycle giveaways. Band on the Sand won silver in this year’s Reader’s Choice Best of Seal Beach for Family & Kids event, Community Festival, Non-Profit and Live Music, as well as the gold for Teen Ambassador, Miss Seal Beach Chelsea Clinton. Partners in the event include the Sun News, the Seal Beach Chamber of Commerce, and the Seal Beach Lions.